Record Store Day returns to preserve independent shops. Most industries don’t get their own holiday. There is no “shoe store day” or anything like that. But there is a Record Store Day, which, since 2007, has served as an international celebration of independent music shops that have weathered the shift toward digital downloads and mega-retailers to maintain the tradition of the neighborhood record store. As evidenced by the chart on this page, the majority of music (we used full album sales for the graphic) is no longer purchased from the neighborhood record store, but rather online or from large retailers. 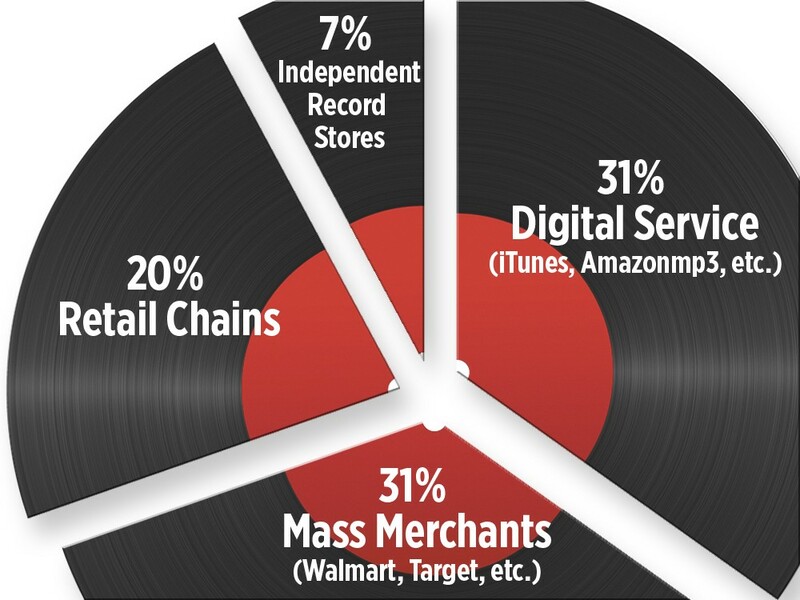 Still, there are more than 700 independent record stores in the U.S. that participate in Record Store Day. One of those is 4,000 Holes, a Spokane shop that has been serving local audiophiles since 1989. Bob Gallagher, the store’s owner, has many of the special Record Store Day releases — collections recorded or released by artists specially for the day — in stock and will also have in-store performances by local musicians beginning at noon. “Record Store Day changed our life. Last year we had a line going around the block,” says Gallagher, adding that his store has undergone a resurgence of sorts due to the rise in popularity of vinyl records. “We’re back to being a record store,” says Gallagher.